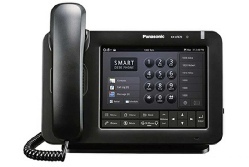 The Panasonic UT range of SIP telephony terminals enhance personal communications through excellent HD quality audio on every phone, combined with easy access to powerful supportive features and applications.The Panasonic UT range of SIP telephony terminals enhance personal communications through excellent HD quality audio on every phone, combined with easy access to powerful supportive features and applications. The range, from standard phones, office key-sets, executive terminals and touch-screen Smart Desk application phones, addresses all requirements. Panasonic's reputation for design, quality, reliability and care for the environment, ensures an exceptional user experience wherever the terminals are deployed - as part of a "cloud based" service or with an IP PBX - in a business environment or in the home.The Panasonic UT range of SIP telephony terminals enhance personal communications through excellent HD quality audio on every phone, combined with easy access to powerful supportive features and applications.The Panasonic UT range of SIP telephony terminals enhance personal communications through excellent HD quality audio on every phone, combined with easy access to powerful supportive features and applications. The range, from standard phones, office key-sets, executive terminals and touch-screen Smart Desk application phones, addresses all requirements. Panasonic's reputation for design, quality, reliability and care for the environment, ensures an exceptional user experience wherever the terminals are deployed - as part of a "cloud based" service or with an IP PBX - in a business environment or in the home.